Summer is just around the corner, and we decided to celebrate our favorite time of year with a color combination that is fun, fresh, and oh-so bold. Pairing a bright magenta with an even brighter orange may seem like color overload, but the key to wearing these summery hues together is simple: just add some neutrals into the mix to balance everything out! 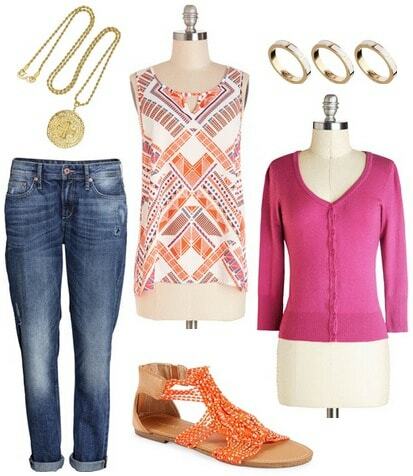 This comfy and casual look is a cute option for a breezy spring day. Start by pairing a printed blouse with a magenta cardigan. Add a pair of loose-fitting cuffed jeans, then pick up on the orange hue of the top with these neon macrame sandals. Keep the jewelry understated and classic with a gold medallion necklace and white enamel rings. For a polished yet low-key ensemble, pair a bold magenta wrap skirt with a lace-trim tee. Glam things up with this standout orange necklace, then slip on some trendy block-heel sandals. Lastly, add a little extra sparkle with a glittery nail polish. If you’re feeling extra colorful, try pairing a lightweight magenta tank with tailored orange shorts. Tone things down with netural strappy sandals, then accessorize with an etched cuff bracelet. For the finishing touch, slip on a pair of cool printed sunnies. Create a fun yet dressy look with this final getup. A magenta drop-waist dress is sure to turn heads, especially when paired with orange chandelier earrings. Keep things on-trend with a unique printed clutch that has orange accents. Don’t forget to grab a pair of killer pumps, like the t-strap heels below. 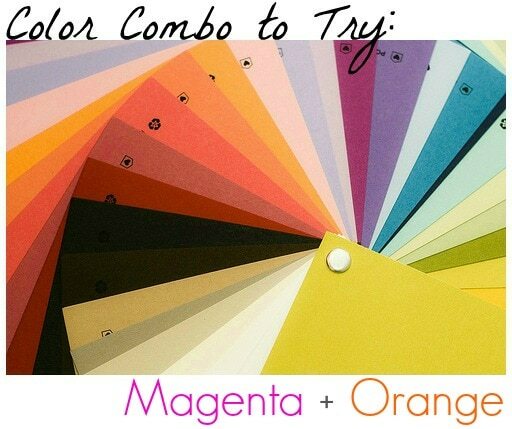 Would you ever pair magenta with orange? What do you think of these outfits? Which one is your favorite? What other color combos would you like to see featured here? Remember to leave a comment below and let me know what you think!